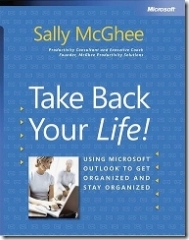 I’m currently reading a really good book entitled Take Back your Life - using Microsoft Outlook to get Organized and Stay Organized by Sally McGhee. Like most people I get a lot of e-mail and I’m looking at ways to manage my time in such a manner that I can get the chance to deal with e-mail effectively. I’m hoping that by using the techniques in this book as well as the ClearContext Information Management System (IMS) I will be able to more productive. Unrelenting e-mail. Conflicting commitments. Endless interruptions. In Take Back Your Life!, productivity expert Sally McGhee shows you how to take control and reclaim something you thought you’d lost for ever your work-life balance. Now you can benefit from Sallys popular and highly regarded corporate education programs, learning simple but powerful techniques for rebalancing your personal and professional commitments using the productivity features in Microsoft Outlook. Clear away distractions and loose ends and focus on what’s really important to you and your business. Take charge of your productivity using techniques and processes designed by McGhee Productivity Solutions and implemented in numerous Fortune 500 companies. Customize and exploit the productivity features in Microsoft Outlook to help you create balance at home and on the job. When you change your approach, you can change your results. So learn what thousands of Sallys clients worldwide have discovered about taking control of their everyday productivity and start transforming your own life today! Chapter Two: What is Personal Productivity? Will certainly be blogging about the key concepts I come across in the book as I continue to go through it. I like this book as well. Good luck getting more productive! I think definitely a lot of IT consultants get caught up in the latest gadgets, certifications and other technical aspects of the job and lose focus on what is really going to sustain them and give them a life-long career – their actual business and the necessary skills required to run a business – any business. Planning and organization is definitely a critical component of running any business, and I always advocate the importance for computer consultants of using organizational software and tools to help stay on top of things. I definitely don’t think what you use is as important as how you use it, but it’s good to see that other consultants are out there trying out different things and being diligent about planning and organizing! I offer a set of resources for IT consultants to help them at all stages of their business within the industry, along with tips for small businesses looking to work with technology firms on a regular basis. Thanks for the blog post!